Our photographer isn't in the office at this time, he managed sneak out for new photo or work trips. We don't know when he plans on returning, but you will see the new and updated work on the photo guide and history projects for Mt. Rainier NP, in the photo galleries, and on the blogs, after he returns and gets the stuff on the Website, see the links on the navigation bar above. 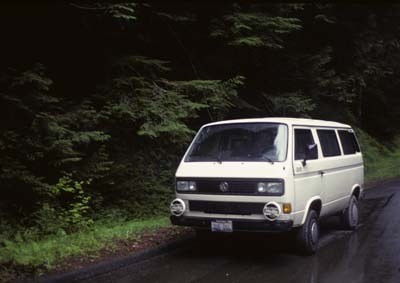 For what it's worth, the photo is of my 1991 Volkswagon Vanagon Syncro, a 4-wheel drive version of the Vanagon. It's a great all-purpose, all-weather vehicle which can carry 7 people, haul 1-ton of stuff or people, or be a basic camper. It's only downfall is that it's not terribly quick or fast with only a 90 bhp motor pushing two tons of van. So, patience is always needed in place of speed.